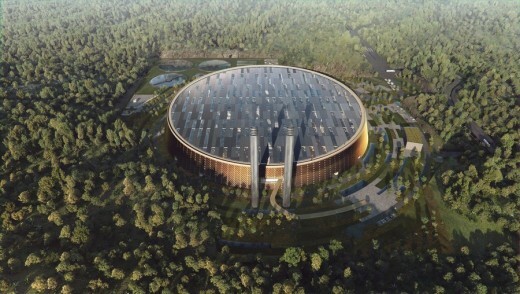 The team of Schmidt Hammer Lassen Architects and Gottlieb Paludan Architects has won an international competition to design the largest waste-to-energy plant in the world. 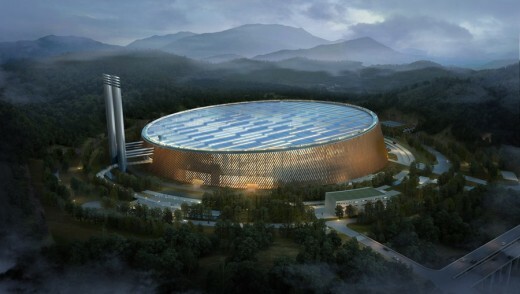 Located on the mountainous outskirts of Shenzhen the new Shenzhen East Waste-to-Energy Plant will incinerate 5,000 tonnes of waste per day – equalling one third of the waste generated by Shenzhen’s 20 million inhabitants every year. 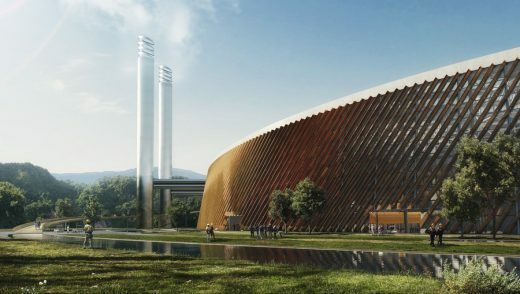 The plant will utilize the most advanced technology in waste incineration and power generation, whilst at the same time act as a source of education for the citizens of Shenzhen. 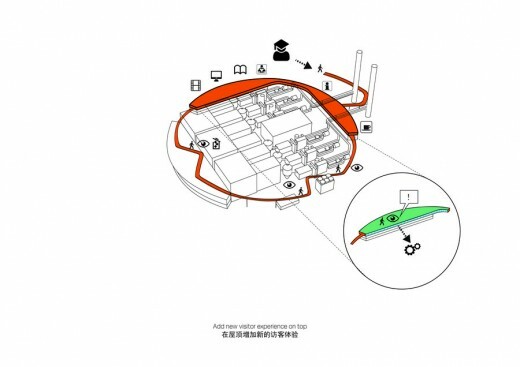 The winning design organizes the entire plant, including auxiliary buildings, into one circular building – breaking with the traditional rectangular layout of industrial facilities. 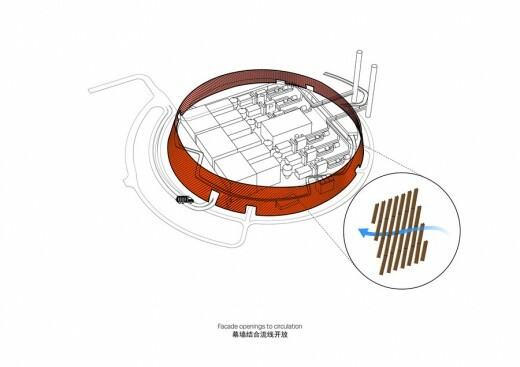 By proposing a clear circular form, the footprint of the plant is minimised and it reduces the amount of excavation required to build on the site. 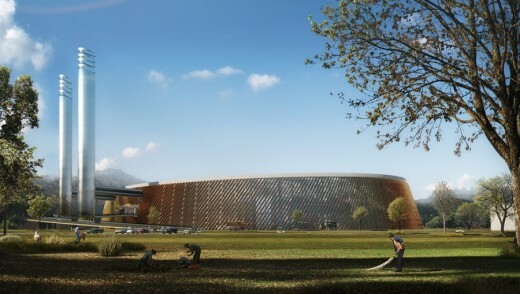 Public visitors are invited into the plant through a landscaped park, via an entrance bridge that rises between the stacks to an entrance lobby and visitor centre overlooking the plant machinery. 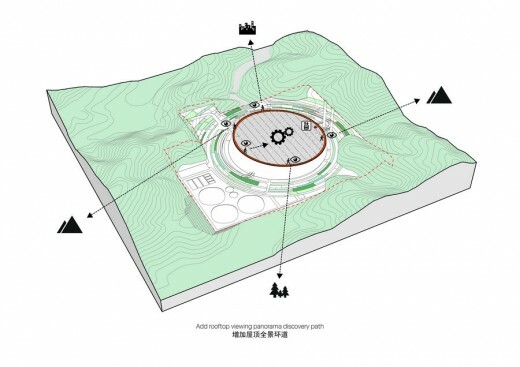 An internal circular path and walkway circle the plant explaining each process, before leading up to a 1.5km panoramic public walkway on the roof overlooking the surrounding landscape and the city of Shenzhen. 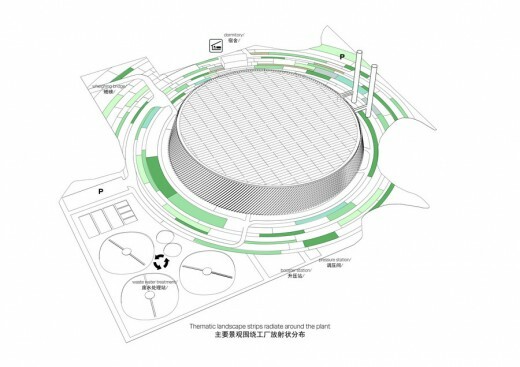 The 66,000m2 roof is designed to be covered by up to 44,000m2 of photovoltaic panels providing the opportunity for the plant to not only provide a cleaner way to deal with the city’s waste but also contribute to the renewable energy provision for the city. 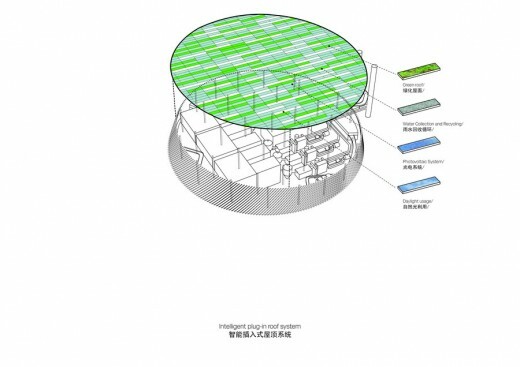 The plant is intended to showcase the Waste-to-Energy production as an important technical process that is geared to deal with the issues of growing waste, as well as the issue of finding more environmentally friendly ways of generating electricity. At the same time visitors become informed on the challenge of the growing amounts of waste we produce every day and are also educated on initiatives on how to reduce their own amount of daily waste. 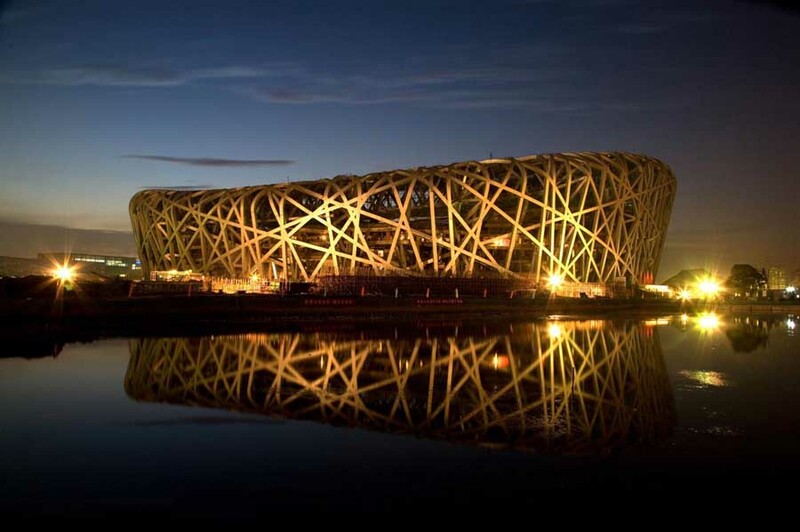 Schmidt Hammer Lassen Architects are one of Scandinavia’s foremost architectural practices known for their award winning work in cultural and public projects and have been active in Asia for almost a decade. 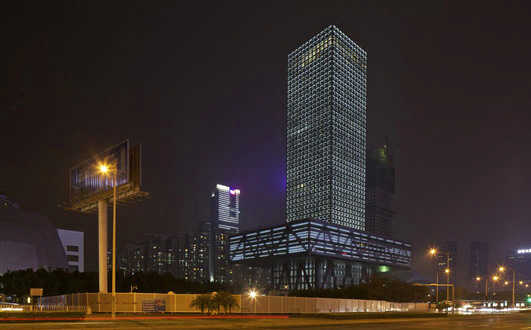 The studio has built a reputation for bringing a strong Scandinavian design approach to large complex public projects in China. 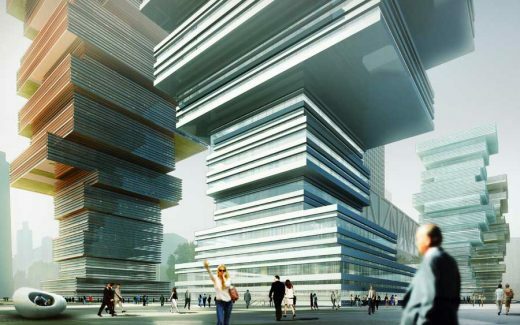 Gottlieb Paludan Architects have received international acclaim for their ability to merge deep technical knowledge with strong architectural design – capabilities that were awarded with the 2015 Nykredit Prize, Scandinavia’s largest architectural award. 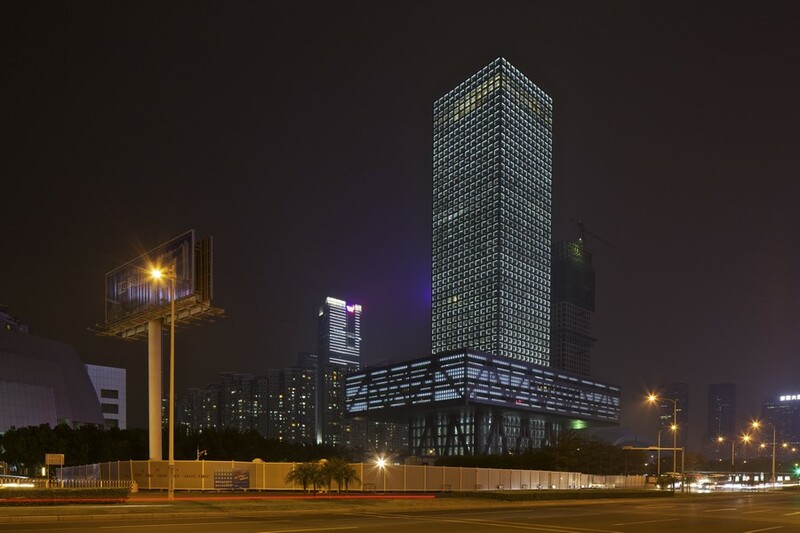 An expert in designing for infrastructure and technical facilities, the Copenhagen-based studio has been active in Northern Europe and Scandinavia for more than a century. Detailed design work is due to begin in early 2016, and the plant is scheduled to start operating in 2020. 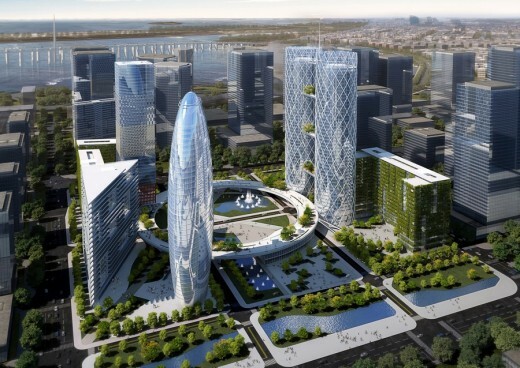 Client: Shenzhen Energy Environmental Engineering Ltd.